The energy consumption varies significantly between different types of kilns as is shown in the following table. Overall, one can say that between 11 and 70 tons of coal is needed to fire 100,000 bricks, or every brick (of 3 kg weight) consumes between 110 to 700 grams of coal. 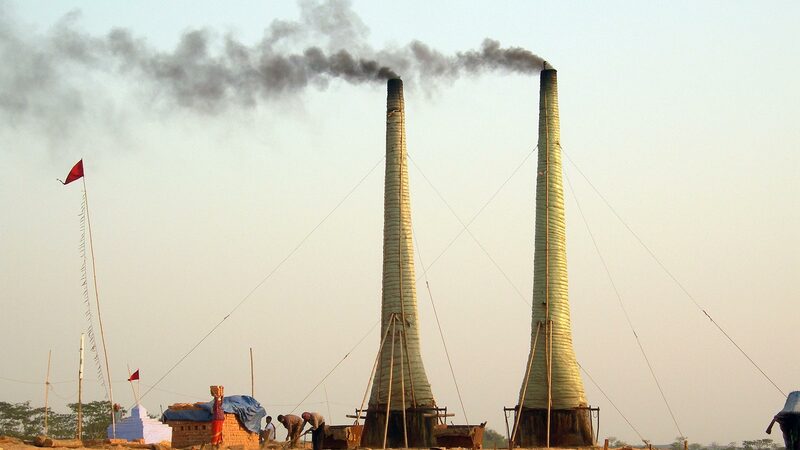 Most brick kilns in Asia are still operating as traditional industries with very limited investments. Batch fired clamp kilns are the most widespread kilns in rural areas and in South Asia the continuous “Bull’s Trench Kiln” (BTK)s are very popular. It has either a moveable chimney or a fixed chimney and is a moving fire kiln i.e the fire moves through the brick stacking in an oval shaped Trench. Tunnel kilns are the most common kilns in industrialised countries and are also found in some Asian countries like China and Vietnam. They are usually highly mechanised and require substantial investments. In tunnel kilns, the bricks are moving through a “tunnel” on a cart. In a Vertical Shift Brick Kiln the green bricks are loaded on the top platform and move slowly down to the central firing zone (see picture in Chapter 2): the fresh air coming from below cools the fired bricks before unloading. The kiln works as a counter-current heat exchanger, with heat transfer taking place between the upward moving air (continuous flow) and downward moving bricks (intermittent movement). The maximum temperature is achieved in the middle of the shaft where fire is maintained. At an interval of 2 to 3 hours, a batch of fired bricks is unloaded at the bottom. A batch of bricks consists of four or six layers of bricks. To understand why the VSBK is the most efficient kiln, we will have to understand that in a brick kiln only a small part of the heat is utilised for the firing and drying operations and most of the heat is lost. Efficient heat transfer process and lower heat losses makes VSBK more efficient. There are thus excellent reasons to promote such an energy-efficient kiln, however, the VSBK has also its limitations and it may not be the best solution for all situations. Due to its relatively short firing period of around 24 hours the green brick-must be suitable to withstand fast heating and cooling to produce high quality bricks and the firing process needs skilled personnel. BTK and intermittent kilns are much less sensitive to green brick quality as the bricks take several days to be fired.